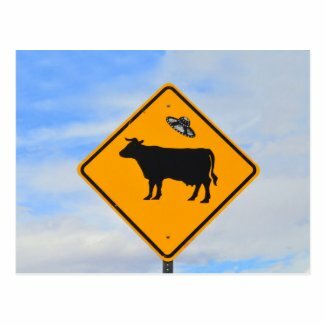 Pranksters have placed UFO stickers on cattle crossing signs on US Highway 68 between Santa Fe and Taos, New Mexico. My friend and fellow photographer Lynn and I recently returned from a thousand-mile (probably more) photography road trip, starting from Kansas City and making a round trip through New Mexico. 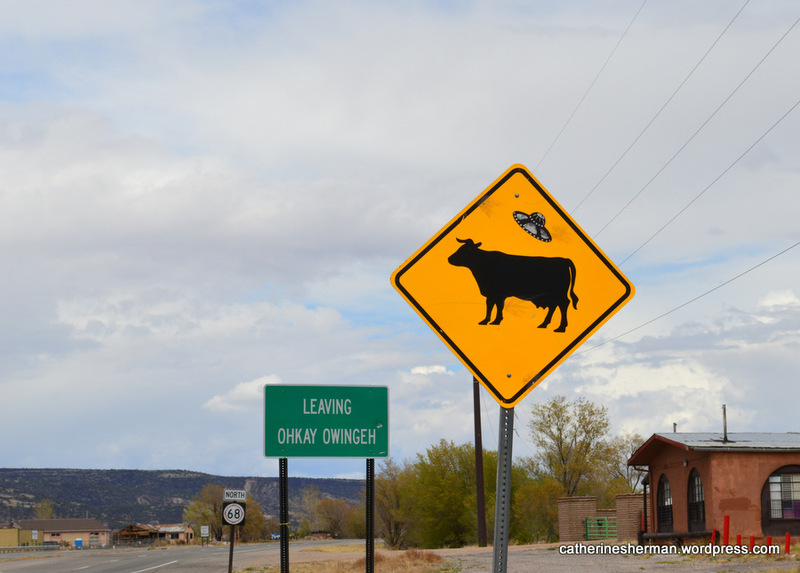 I took about 4,000 photos, some great, some lousy, most were fun, especially this one of a UFO sign on a cattle crossing sign on Highway 68 from Santa Fe to Taos. Pranksters placed the stickers on signs, which officials remove and then more stickers re-appear. Click the link if you want to know the less humorous history behind the stickers… (I don’t recommend it.) Cattle Abductions. Now that all of the holiday events are behind us, including that long stretch of food-eating extravaganzas from Thanksgiving dinner, Christmas parties through New Year’s Day buffets, we can now reflect on 2013 and resolve for 2014. Here’s a funny video about guests and their many eating quirks. Lucky me, I can eat almost anything! I’m tacking on this 2013 annual report from WordPress. The kindly people at WordPress noted that many of my top posts were not written this past year. Rather than saying that I was lazy in 2013, they said this: “Some of your most popular posts were written before 2013. Your writing has staying power! Consider writing about those topics again.” Hope to see you all in 2014. 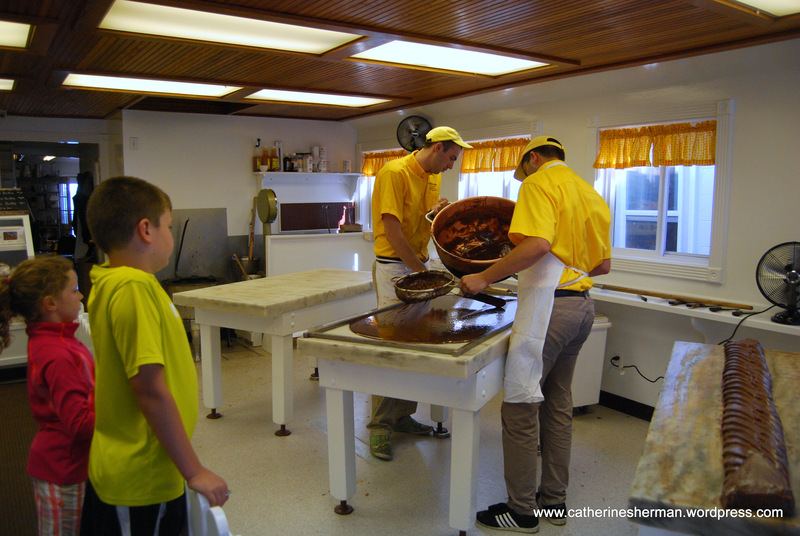 Children are enthralled as they watch workers make fudge in one of Murdick’s Fudge Shops on Mackinac Island, Michigan. “The perfect candle scent for Mackinac Island would be a layer of fudge-scented wax, then a layer of lilac, then at the bottom a layer of horse manure,” joked Joe, one of our carriage drivers on our recent (and first) trip to Mackinac Island, a beautiful island in Lake Huron just between Michigan’s Upper and Lower penisulas. Unfortunately, we just missed lilac season, but we did see plenty of fudge shops and horses, when my husband and I visited in late June. There are more than a hundred varieties of the Common Lilac on Mackinac Island, which celebrates lilacs with a 10-day festival every mid-June, which concludes with a horse-drawn lilac parade. I’d love to return for that event. 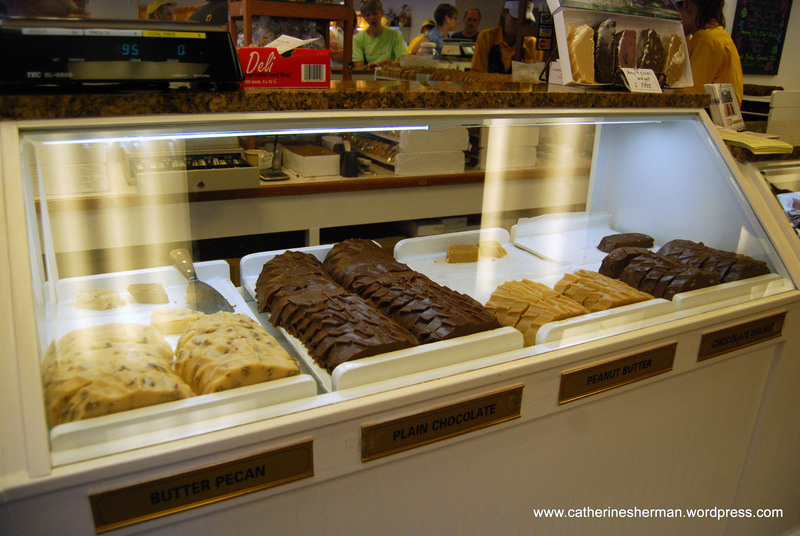 Here are some of the fudge flavors available at Murdick’s Fudge on Mackinac Island, Michigan. Butter Pecan, Plain Chocolate, Peanut Butter and Chocolate Walnut. I bought the fudge for a gift, but I’m hoping the recipients will offer me a taste. (Yes, I managed to come home with uneaten fudge.) I’ve been known to preach (or even screech) about the dangers of sugar, but calorie counts don’t apply to any food eaten or bought on vacation, so I’ve been told. Even sugar is exempted. (Ok, even I don’t believe that.) But an occasional very small indulgence is good for the food soul. I’ll take a couple of extra laps around the neighborhood. Mackinac Island, which is 3.8 square miles, has 80 miles of trails, if you want to walk off your fudge there. The entire island is a National Historic Landmark and 80 percent of it is Mackinac Island State Park. Initially, it was the second U.S. National Park, but the Feds later turned it over to the state of Michigan. 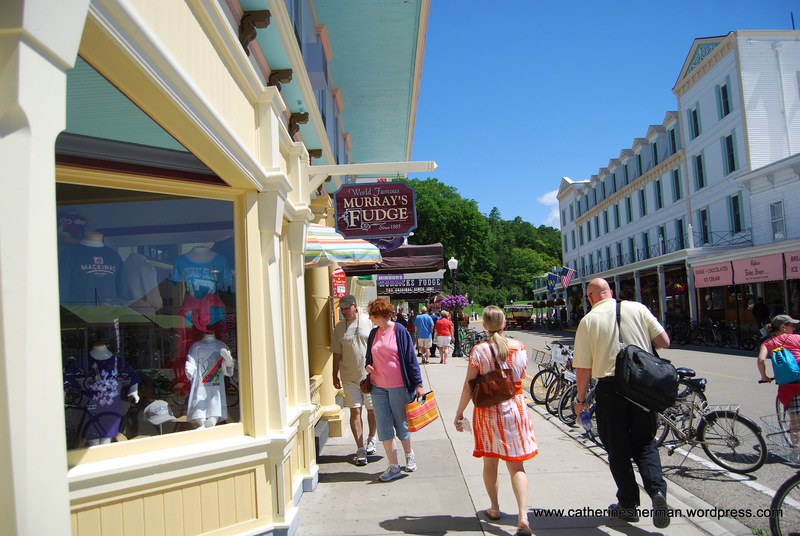 You can count at least three fudge shops in this photograph of a street on Mackinac Island, Michigan. You’d need four hands to count all of the fudge shops on the small island. The fudge shops are clustered conveniently close to where the tourists get off of the ferry. There are as many as 15,000 tourists a day in peak season. The fudge demand is enormous! 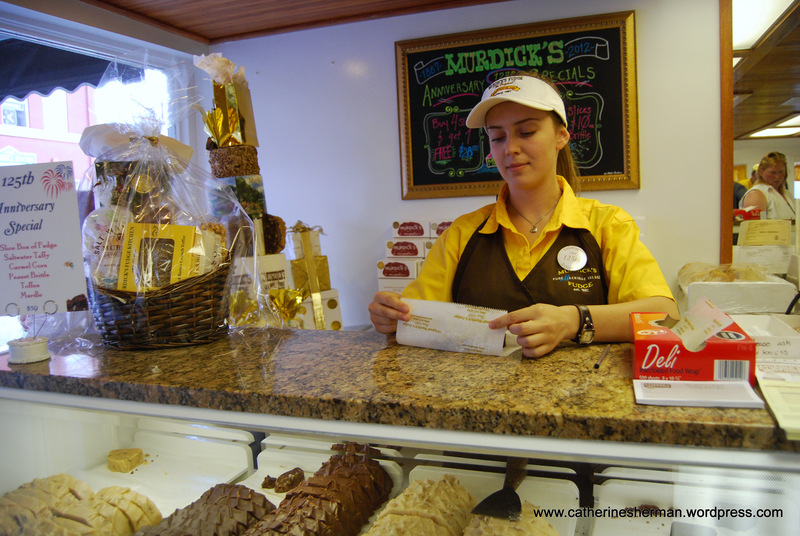 Here, the lovely cashier prepares my fudge purchase. I bought plain chocolate, chocolate espresso and chocolate cherry. Directory of Mackinac Island Fudge Shops.